The Venus Freeze, a powerful yet non-invasive body contouring laser machine, combines a state of the art radio frequency (RF) technology with pulsed magnetic fields for more effective treatments. This combination of warming and cooling produces highly visible results in skin tightening, wrinkle reduction, cellulite reduction and other anti aging results. The technology utilized by the Venus Freeze is FDA-approved, and it can be used on any skin type to achieve tighter, firmer skin. Through the magnetic pulse and RF components of the Venus Freeze treatment process, you can help clients enjoy increased tightness and elasticity, improved circulation and generally healthier, younger looking skin. Adding the Venus Freeze machine can be a big benefit to a growing cosmetic treatment business. By investing in just one machine, you can offer some of the most in-demand cosmetic procedures in your practice and get those new customers in the door. It’s a smart investment in the future that will help attract new clients in order to grow a successful practice. The Venus Freeze offers the convenience of multiple treatment options in one, easy to operate machine. This aesthetic workstation makes it easy to increase revenue through the delivery of safe, painless and highly effective skin restoration services. 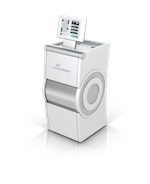 Interested in adding the Venus Freeze laser system to your practice? The Venus Freeze is the perfect addition to any busy cosmetic practice that wants to expand its service offerings to include the most in-demand cosmetic anti-aging services. SunrayLaser.com has amazing deals on used Venus Freeze laser equipment with savings that are up to 60% off the original price! See for yourself how much you can save on high quality used laser equipment when you buy from SunrayLaser.com. Looking for pricing information and other details about our selection of preowned Venus Freeze machines? Please fill out the form below and we’ll provide a fast and free, no obligation quote. It’s an easy and no-risk way to learn more about this outstanding line of cosmetic lasers.